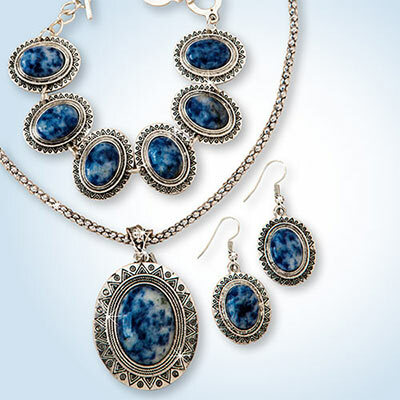 Stunning oval soladite stones are the stars of this set! The pretty marbled pattern pairs deep sky blue with snowy white to create a one-of-a-kind look in each natural stone. Richly detailed in a pewter-tone relief design, the setting brings out a pearl-like quality in the stones for an exotic, yet sophisticated, look. Wear each piece separately or as a set. 3 piece set. Necklace, 19"l with 2" extender; 2"l pendant; Bracelet, 8¼"l; Earrings, French wires, 1½"l.